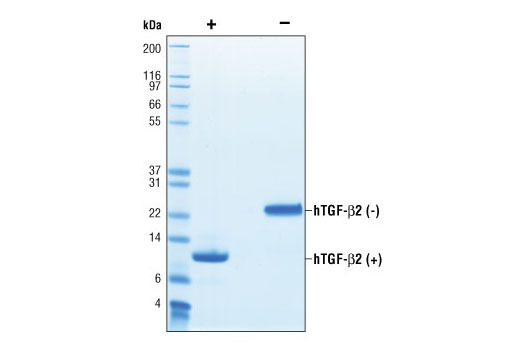 The purity of recombinant hTGF-β2 was determined by SDS-PAGE of 6 µg reduced (+) and non-reduced (-) recombinant hTGF-β2 and staining overnight with Coomassie Blue. The inhibition of IL-4 induced proliferation in HT-2 cells treated with increasing concentrations of hTGF-β2 was assessed. After 48 hour treatment with hTGF-β2, cells were incubated with a tetrazolium salt and the OD450-OD650 was determined. Western blot analysis of extracts from HT-1080 cells untreated or treated with TGF-β2 for 15 minutes, using Phospho-Smad2 (Ser465/467) (138D4) Rabbit mAb #3108 (upper) and Smad2 (86F7) Rabbit mAb #3122 (lower). Recombinant human TGF-β2 (hTGF-β2) Ala303-Ser414 (Accession #NP_003229) was expressed in human 293 cells at Cell Signaling Technology. >98% as determined by SDS-PAGE of 6 μg reduced (+) and non-reduced (-) recombinant hTGF-β2. All lots are greater than 98% pure. Recombinant hTGF-β2 contains no "tags" and the nonglycosylated protein has a calculated MW of 12,719. DTT-reduced protein migrates as a 12 kDa polypeptide and the non-reduced cystine-linked homodimer migrates as a 24 kDa protein. The expected amino-terminal ALDAA of recombinant hTGF-β2 was verified by amino acid sequencing. The bioactivity of recombinant hTGF-β2 was was determined by assessing inhibition of IL-4 induced HT-2 cell proliferation. The ED50 of each lot is between 0.1-0.3 ng/ml. Less than 0.01 ng endotoxin/1 μg hTGF-β2. With carrier: Lyophilized from a 0.22 μm filtered solution of 35% acetonitrile and 0.1% trifluoroacetic acid containing 20 μg BSA per 1 μg hTGF-β2. Carrier free: Lyophilized from a 0.22 μm filtered solution of 35% acetonitrile and 0.1% trifluoroacetic acid. TGF-β2 is produced by eosinophils, astrocytes, glioblastoma and other cancer derived cell types (1-6). TGF-β2 inhibits antigen-induced T-cell proliferation, inhibits epithelial cell proliferation, induces mesenchymal cell proliferation and has cell specific effects on apoptosis (1-8). TGF-β2 binds to TβRII and binding is promoted by TβRIII. TβRI then complexes with TβRII and TβRIII (3,5). Signaling involves phosphorylation of the SMAD proteins (2,3,9). 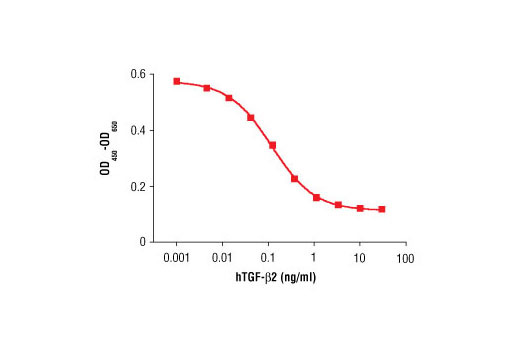 TGF-β2 also activates Erk2, p38, and JNK pathways (9). Knockout of TGF-β2 in mice severely impacts heart, lung and eye development (10). Balzar, S. et al. (2005) J Allergy Clin Immunol 115, 110-7. Hinz, S. et al. (2007) Cancer Res 67, 8344-50. Zhang, H. et al. (2008) Immunology 124, 304-14. Dufour, C. et al. (2008) Am J Physiol Endocrinol Metab 294, E794-801. Zuckerwise, L. et al. (2016) Oncotarget 7, 38398-38407.